Kurz stressed that Austria and Serbia had close ties in the political, economic and cultural fields. "At the meeting with [Serbian] President Aleksandar Vucic in Sofia, we have shared our expectations for tomorrow's summit with the Western Balkan countries and Austria's [upcoming] Presidency of the Council of the European Union. We intend to further promote negotiations with Serbia on its [EU] accession," Kurz wrote in a tweet. — Sebastian Kurz (@sebastiankurz) 16 мая 2018 г. ​The Austrian chancellor stressed that Serbia was the basis for the stability in the Western Balkans and noted Serbia's progress in the accession talks. Earlier this month, President of the European Parliament Antonio Tajani said that Serbia, as well as Montenegro, may complete their accession to the European Union by 2025. At the same time, the European Commission released in February 2017 its strategy for the Western Balkan countries called "A credible enlargement perspective for an enhanced EU engagement with the Western Balkans," setting a number of goals that should be achieved by the candidate countries in order to complete the accession process. 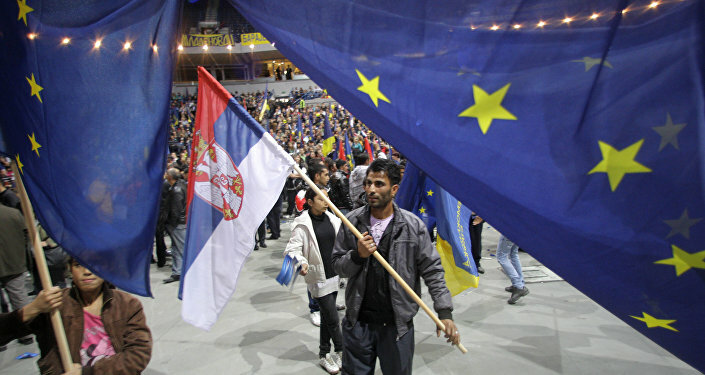 In 2003, Brussels identified Serbia as a potential candidate for accession to the European Union. In 2009, Serbia formally applied for the EU membership, after which it was officially granted EU candidate status in 2012. The accession negotiations between Serbia and the European Union formally started in January 2014.